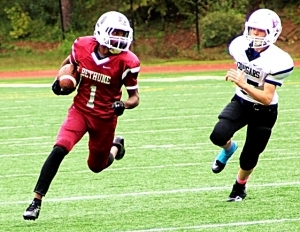 Defending DeKalb middle school football Trail to the Title champions Tucker Tigers and 2017 runners-up Bethune Lions won their semifinal games to set up a rematch of the 2017 championship game. Bethune (7-1) secured its fourth appearance in the title game with a 33-0 win over the Henderson Cougars (6-2) behind the three-touchdown performance of Bernard Mack. The Lions got on the board first as Isaiah Logan ran for 26-yards to the Henderson 25 to set up the first score of the game. Logan connected with Armond Davis on a 25-yard touchdown pass on the next play for a 6-0 lead with 5:50 left in the first quarter. Henderson blocked the point after try. Mack picked up his first touchdown of the game with 3:23 to go in the first half as he fielded a punt at the Henderson 47, avoided a tackler and turned up the right sideline and into the end zone for the score. Donald Dunn leapt high in the back corner of the end zone to haul in the two-point conversion pass and Bethune held a 14-0 lead with 1:38 to play in the first half. The Lions’ defense held on a fourth and 2 at their own 48 on Henderson’s next possession to set up Mack’s second score of the game. Mack got loose on a quarterback keeper on the very next play of the game and raced 52 yards for the touchdown. Henderson’s Chance Thigpen who had several plays in the Bethune backfield during the game broke through to block the PAT to keep it at 20-0. Henderson had a 43-yard touchdown run by Jayden Guerrero nullified by a penalty on its next possession. Quarterback Evan Sanders picked up 25 yards a couple of plays later and the Cougars were threatening to put points on the board before halftime. With time running out in the first half Letrelle Richardson intercepted a Henderson pass at the Bethune four-yard line and returned it up the left sideline 96 yards to the touchdown. Logan hit the PAT to make it a 27-0 Bethune advantage at the half. Mack wrapped up the scoring in the game as the third quarter ended with his second punt return of the game. Mack’s 36-yard return made it a 33-0 final margin. Isaiah McBean led all rushers in the game with 18 carries for 109 yards to lead Henderson. 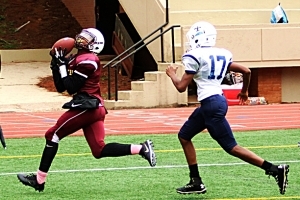 Nathaniel Miller threw for 136 yards and two touchdowns to lead the Tucker Tigers (7-1) into their sixth consecutive championship game with a 28-14 win over the Cedar Grove Saints (5-3) last Saturday at Adams Stadium. Jordash Tanksler’s 16-yard punt return to Cedar Grove’s 30-yard line with 3:11 left in the first quarter set up Miller’s first touchdown pass. Facing fourth and goal at the Saints seven Miller dropped back and arched a pass towards the back, right corner of end zone where Bryce Bowens pulled the catch in and came down inbounds for the touchdown. Jayquan Billingsley ran in the two-point conversion for the 8-0 lead with 1:12 to play in the first quarter. A 26-yard completion from Cedar Grove quarterback Jamar Graham to receiver Alvin Houston with 5:24 to play in the half closed the gap to 8-6 in favor of the Tigers. The Saints two-point try was no good. Tucker wasted no time as Miller went to the air with Bowens again hitting him in the middle of the field where he raced down the field for the score. Billingsley again added the two-point try to make it 16-6 with 3:09 to play in the first half. Cedar Grove’s defense kept it a two-score game going into the half as they stopped Tucker on fourth down at their own nine yard-line. The Saints knelt to end the final 25 second of the first half. Tucker extended the lead to 22-6 with Billingsley scoring on a four-yard run up the middle with 52 seconds left in the third quarter. The two-point try was no good. The big play in the Tigers’ possession was a 52-yard pass from Miller to Jacquez Cullars down to the four-yard line. Cedar Grove began an answering drive with a bit of luck as a Tucker defensive back tipped a Graham pass that landed in the hands of Houston for a 33-yard gain to the Tucker 20. Tucker’s defense looked to have forced a turnover on downs at their own 24 as a fourth down pass went incomplete, but a roughing the passer call gave the Saints the football at the Tiger 12-yard line. Graham connected with Houston again for the touchdown as the play covered 12 yards with the clock ticking down to 7:35 to play. Naeshawn Parsons ran in the two-point conversion to make it a 22-14 game in favor of the Tigers. D’won Martin intercepted a Tucker pass with 7:24 to play and returned it 12 yards to the Tucker 36. To set the Saints up in business trailing by just eight points. Cedar Grove converted a fourth down into a new set of downs with a fake punt pass hauled in by Lamaze Williams. Facing fourth and 14 at the Tiger 28 with 3.6 seconds to play, the Saints went to the air only to have Billingsley step in front of a pass for an interception and 96-yard return for a touchdown as time expired. Graham was 9 of 20 passing for 132 yards and a pair of touchdowns to lead Cedar Grove while receiver Alvin Houston had four receptions for 106 yards and two touchdowns. Tucker and Bethune’s 2017 championship rematch is set for 10:00 am at Adams after the Tigers won the coin toss. Tucker goes for its third title in six years while the Lions are looking for the programs first championship after falling shot for the third time a year ago with a score of 38-6 to the Tigers.